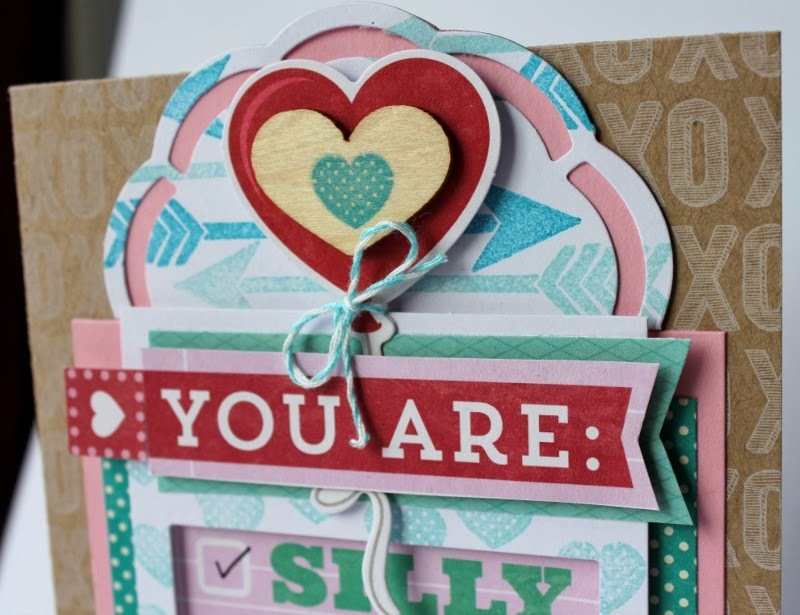 This scrumptious love card was created with the fabulous new Heart Healthy Red Bean Soup papers and three different stamped Jillibean Soup Stampables. The base of the card was made with Red Sherry paper providing a nice neutral background. Then begin layering with two mats, one in pink cardstock and the other in Turquoise Salt. Now the first stamped item is the upside down stampable white frame, stamped in ocean blue ink mini hearts from the Heart Healthy Red Bean stamp set. Then I added on the main panel from the Heart Healthy Red Bean Soup Bite Size Bits paper. Cutting the top title off to reattach later and centering it inside the white frame as shown, the frame being added with 3D foam dots. Then the top title was layered onto a turquoise pattern paper and matted as shown with more 3D dots. The small heart next to the title was cut from Bite size bits paper too and added with foam dot. The white stampable doily was cut in half and stamped in two shades of blue with the arrow stamp from the Heart Healty stamp set. Then the balloon was selected from the Heart Healthy pea pods and added over the doily with foam dots. Layered onto it is the wood heart stampable stamped with the heart stamp again in the darker shade of blue and attached with a glue dot. Grab some turquoise bakers twine and tie a bow around the pea pod balloon as shown. Another wood shape stampable banner was added after it was stamped on in blue ink the “Be Mine?” sentiment and attached with more 3D foam dots. Your sweetheart will love this any time of the year! 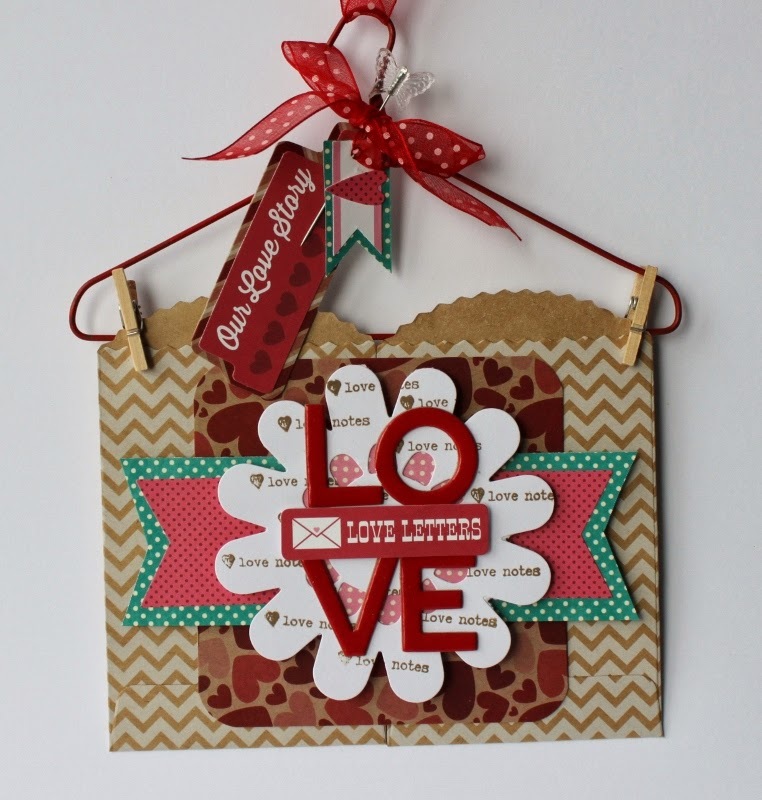 This mini hanger is the perfect spot to hide away love notes for your loved ones! The project was created with the Heart Healthy Red Bean Soup papers and a Stampables stamp. The hanger started with attaching two mini chevron bags together and adding lots of dimensional layers on top. First a panel of Heart Healthy Bay Leaves was attached with adhesive to the two mini bags to hold them together. Next a Heart Healthy banner sticker was attached to a strip of Turquoise Salt and trimmed down to match. Then I created extra interest by stamping the white doily first with the love notes stamp from the Notebook Paper stampables collection set. Then I added a Pink Salt backer to the doily before I attached it with 3D foam dots to the hanger. The brand new beanboard alphas were added next to spell out L,O,V,E they have an adhesive back, so just peel and stick. Then a Heart Healthy sticker, Love Letters, was added in the center. The entire piece was hung with mini wood clothespins to the hanger. Then I dressed up the top of the hanger with stickers from Heart Healthy labels sticker sheet and mounted them on coordinating papers with a swallowtail sugar pick and a red polka dot bow finished it off. 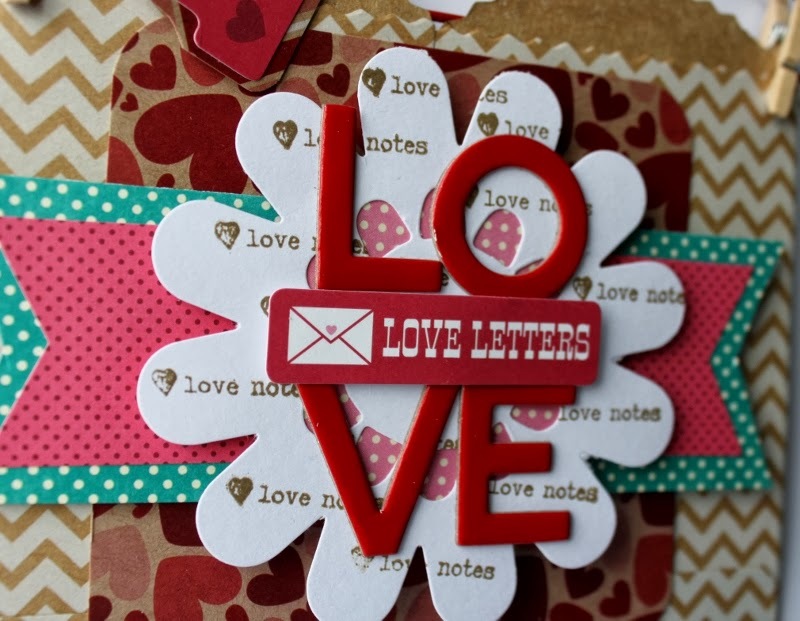 So surprise your loved ones with some love notes, maybe they will even leave some notes for you in return!